Jack Rogers new Spring 2010 collection is about more than a great sandal. We basically grew up in Jack Rogers' Navajo sandals. Like new shoes for school, summer meant a new color of our favorite Navajo sandals ready to be broken in and worn with everything, from our Sunday School pinafores to blue jeans. We are from Connecticut, after all. But as it goes for most things that we love here in Connecticut, they were hearty on all those good things, like tradition, stuffy values, and classic style. But, unfortunately for us, a little oblivious in terms of the fashion forward. So when we heard rumors that they were launching a clothing collection this spring -- we were thrilled. When we contacted them, and found out there was an updated shoe collection and handbags to go along with it -- we were ecstatic. When we were given the exclusive of the first peek at the Spring 2010 debut look book -- words cannot describe! Want This: So we heard you were just at CoterIe debuting the brand revamp and clothing collection, how did it go? Bernadette Murray: Everybody was really responsive... It's funny because the first ever specialty retailer for Jack Rogers was Saks Fifth Avenue. After Jackie Kennedy was photographed in Palm Beach coming out of church on Good Friday in 1962, the press picked up the images and Saks jumped on board to be the first specialty retailer to carry the line. Now we're going back with them and they're going to be carrying an exclusive "SFA" monogrammed Navajo sandal. WT: The Navajo is your classic signature sandal, but what other re-vamps of this style are we going to be seeing this season? BM: Right now we're looking at all the different feasibilities for customizing your Jacks. I just made my own custom version, with white pony hair and brown suede stitching. We're investigating the online technology, we want to make it available to everybody. WT: So you'd be able to create your own custom pair, down to the leather stitching and monogram? BM: Yes, we're looking at the trend of social shopping -- with all the young women seeing something they can design online and uploading it to social sites and sharing it with their friends to see what they think of it. WT: What was the main inspiration behind the clothing line -- The Navajo? BM: The rondels, the circular leather pieces that make up the Navajo sandals, certainly make an appearance. There's embroidery of them on the clothing, handbags, and accessories... Our new ballet flats also have the whipstitching like the Navajo and the embossed roundel design as well. BM: Definitely, we just had platform versions of the Navajo that you can order online now. The same classic with a modern update. Classic with a modern twist can also be used to describe the Spring 2010 collection. Khaki separates, breezy tunics and shifts in eyelet and cotton with raw collars and ruched sleeves, and perfectly pleated trousers and short shorts in sea inspired shades with appeal that will sweep the East Coast, from Palm Beach to West Hartford, and beyond. Additionally, straw beaded clutches and a leathwoven handbag that is to-die-for (and ready to give Isabella Fiore a run for her money) head up the accessories collection and of course, adorable (and affordable) flats and sandals galore. 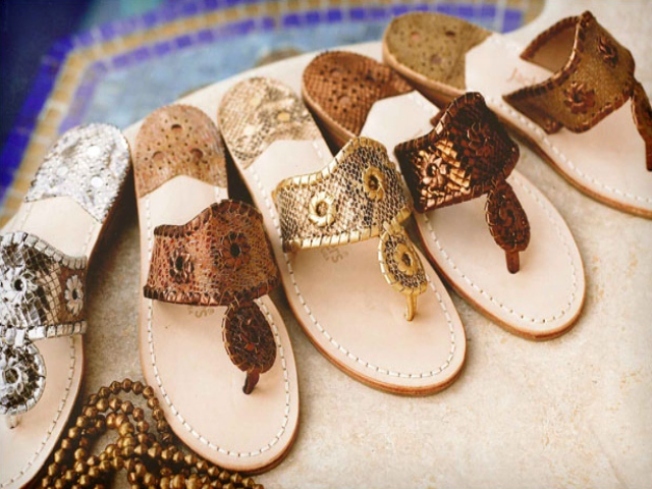 The new collection is coming in waves (lucky for us, so we can stagger out our growing wish list) so e-mail customerservice@jackrogersusa.com to be notified when your favorite new products arrive!